These three stocks have already delivered impressive gains -- but they're only just getting started. Few things feel better when you invest than to see shares of a favorite stock double. But while it might be tempting to take your profits and run -- or, worse, to avoid buying shares of such a business after they've risen -- the world's best investors know that the market's biggest winners simply keep on winning. So we asked three top Motley Fool contributors each to pick a stock that has doubled, but still has room to grow. Read on to learn why they like iRobot (NASDAQ:IRBT), Square (NYSE:SQ), and Twilio (NYSE:TWLO). Steve Symington(iRobot): iRobot shares may have tumbled more than 11% after its third-quarter 2018 report earlier this week, but don't take that to mean its performance was disappointing. To the contrary, shares of the home robotics leader have still doubled over the past two years. And this week's pullback was primarily related to concerns over the impact on the Roomba-maker of a new 10% tariff on vacuums manufactured in China. But even after accounting for that tariff -- which shaved $5 million from iRobot's operating income last quarter -- the company still not only crushed expectations for both sales (up nearly 29% to $264.5 million) and earnings per share (up 47% to $1.12), but also raised its full-year financial outlook. For that strength, iRobot can thank consumers' overwhelmingly positive reception to its newest Roomba line, including its premium self-cleaning i7+ model. To be fair, iRobot also warned that, as proposed, the tariffs are set to increase to 25% at the start of next year. If that happens, iRobot says it could certainly place "moderate pressure" on the broader robotic vacuum cleaner category. In the meantime, however, iRobot has pledged to reduce costs and work to mitigate the impact of tariffs on its longer-term growth. In addition to fostering its core Roomba products and operational efficiency initiatives, those efforts will include exclusive marketing to raise awareness for its increasingly popular Braava floor-mopping bots in both the U.S. and Japan. Finally, recall that iRobot is working on expanding its reach to other categories. Founder and CEO Colin Angle has listed lawn-mowing, laundry-folding, bathroom-cleaning, and loading and emptying dishwashers as among other areas of interest. And earlier this year, Angle expressed his belief that "in the next three years the true winners in the consumer robot industry are going to be determined for the next decade." For investors willing to bet on iRobot's long-term success in the face of its short-term tariff concerns, I think the stock has plenty of room to run from here. Travis Hoium (Square): There are a lot of companies fighting for the future of digital payments, but no one has the same scale or capabilities as Square. The company has become synonymous with coffee shops and food trucks, but it's expanded to include scheduling, marketing, and even loans to small businesses and consumers. The ecosystem of offerings has allowed the company to nearly triple revenue over the past five years, while inching closer and closer to breakeven on the bottom line. As Square has grown its offerings, the company has been able to attract bigger customers than the small businesses that traditionally used the platform. In the second quarter of 2018, 22% of gross payment volume came from sellers with over $500,000 of annual volume, up from just 6% in the first quarter of 2014. What's great about Square's business model for the long term is that the company effectively locks customers into its products. Square's payment platform serves as the touchpoint consumers see, but businesses that use Square like its integrations with appointments, payroll, marketing, and more. Breaking free of Square once you're using those features is easier said than done. Given the growth of Square and the pace at which the company is adding features, I think this is a company that will grow for a long time to come. And with more companies moving to digital payment solutions, there's a macro wave that Square can ride to a much higher stock price in the long run. Leo Sun (Twilio): Twilio's cloud-based services handle text messages, calls, videos, and other features for mobile apps. In the past, developers built those features from scratch, which was a time-consuming process and tough to scale. Twilio simplified the process with an API which developers could integrate into the app, which outsources those services to Twilio instead. Many popular apps -- including Airbnb and Facebook's Messenger and WhatsApp -- use Twilio's API. Demand for Twilio's services is surging. Its revenue rose 44% annually to $399 million last year, and analysts expect 48% growth this year. 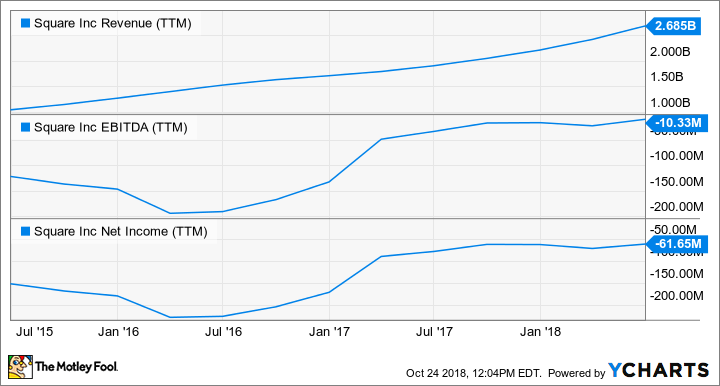 Twilio remains unprofitable by both GAAP (generally accepted accounting principles) and non-GAAP measures, but that isn't unusual for a growing cloud company. Twilio's stock more than doubled over the past 12 months. The bears will argue that the stock is pricey at 13 times this year's sales, that it doesn't have a clear path toward profitability, and that it faces competition from similar platforms like Bandwidth and Vonage's Nexmo. They'll also note that Twilio generates most of its revenue from a handful of big customers, and losing a major customer -- like Uber last year -- could hurt its long-term growth. However, I believe that Twilio will keep locking in customers with a growing ecosystem of cloud services -- which include new security, video, and cloud contact platform tools -- while gaining new customers with its best-in-breed reputation. Therefore, I believe Twilio still has plenty of room to run over the long term. We can't absolutely guarantee that these three businesses will extend their outperformance and beat the broader market. But between iRobot's longer-term growth ambitions, Square's enormous scale and stickiness, and Twilio's market leadership with an enviable ecosystem of cloud services, we believe chances are high that they'll do just that.